Tronair is the global leader for ground support equipment and is considered by many to be the best in quality and value. Products include: towbars; electric towbarless tugs ranging in capacity from 30,000 to 100,000 lbs; tripod and axle jacks; tail, work and engine stands; engine slings; compressor washers; hydraulic power units; ground power units; ram air turbine (RAT) test equipment; fluid service units; deicers; lavatory and potable water service units; air conditioning; nitrogen and oxygen transport carts; landing gear service and much more. Tronair’s quality, value and service create dependable products for general aviation; business; regional; commercial; rotocraft and military customers worldwide. Tronair manufactures a full line of quality, OEM approved tripod and axle jacks. The threaded rams of all 5 thru 30 ton tripod jacks are equipped with hand wheel safety nuts. 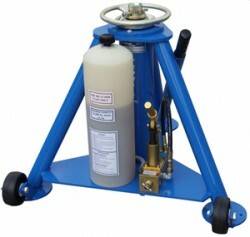 Air pumps are available on jacks where they are not standard. Don’t take a chance with any other jack! Always choose the proven reliability of every Tronair jack. 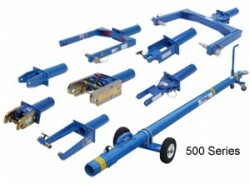 Tronair manufactures five basic towbars: custom, multi-head, portable, snap-bak and narrow and wide body. We have models available for light, single engine aircraft thru the biggest commercial aircraft. Solid, dependable towbars you can rely on. Tronair also manufactures 500, 600 and 800 series attachment heads. Every head attaches easily to the multi-head towbar via a ball lok T-pin. Shear protection is built in to protect nose gears as required. Keep hangar floor space organized -store your attachment heads in our Multi-Head Storage Rack. Tronair’s line of environmentally friendly towbarless tugs have the power and reliability to get the tough jobs done! Models include the JP30, JP75 and JP100 with towing capacities of 30,000 lbs, 75,000 lbs and 100,000 lbs respectively. Many customers consider JETporter’s ease of operation to be the best in the industry. Customers value the on board battery charger because a fresh charge is only the closest outlet away. Move your units safely and efficiently with these rugged, compact, maneuverable units. The newest addition to Tronair’s line of electric towbarless tugs is the JP100SSC SOFTCAPTURE® tug. It is equipped with the patented SOFTCAPTURE® cradle which allows the tug operator to safely capture aircraft from the driver’s seat without the use of straps on the strut or any part of the nose landing gear. This saves time and money by allowing you to move aircraft without getting off the tug. The SOFTCAPTURE® mechanism eliminates the negative “strap capture” events so common when the strap is wrapped around the strut. The unit is designed to fit most common dual nose-wheel aircraft. The JP100SSC will revolutionize how you move aircraft! Tronair offers a wide variety of hydraulic power units to meet your specific aircraft requirements. Commercial, regional and business aircraft use Tronair HPUs to increase aircraft component life and reduce aircraft filter changes. Our HPUs have the best filtration in the industry! 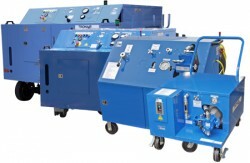 Connect aircraft to hydraulic power unit via self sealing, quick disconnect couplings. Fluid contamination can be devastating to an aircraft causing flight problems, safety issues, damage to expensive components and unscheduled aircraft downtime. Ensure clean fluid with HPU Self Cleaning Circulation Kits!